We recently enrolled our dog Sam in Puppy School…again. This will be his third time. In theory, Sam seems to have the basics down. When we tell him to “sit,” he does…at least when he feels like it. At the command “down”, our puppy will happily collapse on the ground. That is unless he can find something better to do. He seems to think that our demand to “stay” means to sit for a moment and then go wander off hunting for something to chew on. “Heel,” of course, means to stay at the very far reaches of the leash and to tug really hard. While we are are fairly certain that these small flaws are ours and not his, we are still calling this latest class Remedial School. At the last class session, our wonderfully patient instructor, Cheri, announced that we all needed to teach our dogs a trick outside of class. Much to my relief, mine wasn’t the only groan of dismay that filled the room. The thought of teaching a trick that our dogs hadn’t been exposed to before and outside of the basics seemed to be more than a little daunting for everyone. Cheri merely laughed at our discomfort and went over a few common tricks that we might want to teach our pet. Due to Sam’s limited attention span, I knew that we were going to have to do something fairly simple. I was hoping that looking adorable would work, but didn’t think Cheri would count that as a trick. Despite that fact that we were told “shake” was actually a hard trick, I thought we might be able to pull it off. I had noticed that Sam often held his paw up in the air for no particular reason. I was hoping that we would be able to harness that strange little quirk of his into something impressive. The hardest part of training Sam was to convince my oldest daughter that she should be the one to do it. After all, she had trained our dearly departed Shelly how to “shake” in about ten minutes. It took a lot of badgering, but KT reluctantly agreed to try to teach Sam the trick. Armed with a clicker and a bag of treats, my girl set to work. Much to everyone’s surprise, (Except mine, I always knew he was brilliant), Sam picked it up almost immediately. As for Sam, he loves this trick. It’s as if he was born to “shake” and has been waiting all this time for us to realize it. If we ask him to “sit” Sam will eagerly sit down and put his paw up for us to shake. If we don’t grasp it in our hand right away he will put both of his front paws up in order to show us how well he can do it. When we tell him “down”, his entire body hits the ground…except for that one paw. While Sam may not excel in the basic commands that most well-trained dogs can do in their sleep, our brilliant puppy will always impress us with his rare social talent of “shaking.’’ We can hardly wait to show Cheri how talented he really is at Puppy School tonight. 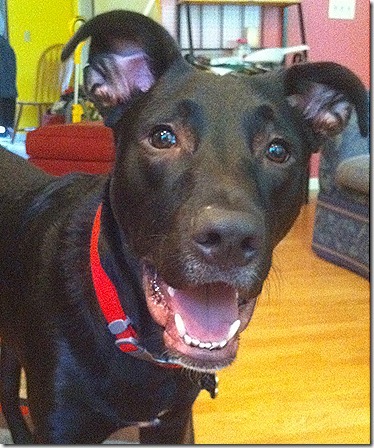 This entry was posted in Family, Humor, Sam, the naughty pup and tagged clicker training, Dog training, Humane Society. Bookmark the permalink. He was just waiting for you to start working on the advanced stuff. oh he look darn doggy proud, he does! All this time you were teaching him how to add 1 + 1 and all he wanted to do was algebra. Too cute. Sam is undoubtedly brilliant. Do they have Gifted and Talented classes for him?